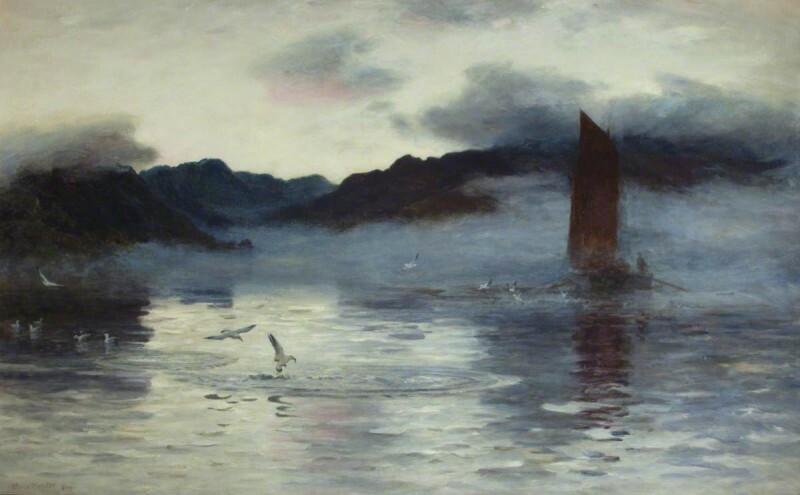 Harris Museum and Art Gallery started a discussion to try to identify the location on the west coast of Scotland that is depicted in Colin Hunter’s atmospheric painting, calling on anyone who recognised the mountains in the far background. Martin Hopkinson commenced the discussion by suggesting the Isle of Skye, based on the work’s similarity to several of Hunter’s other depictions of this location, notably his 1895 work Goodnight to Skye. Several other contributors proposed alternative locations, among them Elizabeth Wilson, who suggested the River Clyde, drawing parallels between the mountains surrounding its estuary and those depicted, as well as pointing out that Hunter often painted the location as a subject. However, Andrew Greg argued that the mountainous scene depicted was perhaps ‘too craggy’ for the Clyde, implying that an alternative proposal would be more suitable. One such suggestion came from John C. Morrison, who speculated that the composition might depict part of the Cobbler range seen from Loch Long, adding further that this location was once a significant herring fishery. This proposal was queried by Greg, who argued once more that the Cobbler was ‘not so craggy’ low down, in comparison with the mountains in the painting. Greg therefore felt Hopkinson’s suggestion most convincing, concluding that the location depicted in Hunter’s painting was in fact the Isle of Skye, because of the close resemblance between the work and Hunter’s other depictions of Skye, as well as photographs of the island. As a result, a new description has been added to the painting’s record by both Art UK and the Harris Museum and Art Gallery. Does anyone recognise the mountains in the background of 'Signs of Herring'?